Chlorophyll is the green pigment that plants use to absorb sunlight for photosynthesis. GoMOOS measures chlorophyll concentration as a proxy for the biomass of microscopic marine plants (i.e., phytoplankton). This is the first time that phytoplankton biomass has been monitored in the Gulf of Maine on a continuous basis in real time. 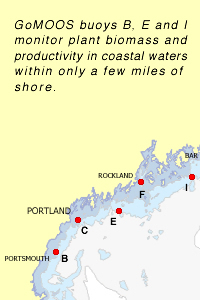 We measure chlorophyll along the Gulf of Maine coast. Plots above show how chlorophyll varied over the last eight days. Differences among buoy traces are the result of environmental factors, such as river input, cloud cover, winds, currents, and water stratification. Variation in chlorophyll, through time and across the Gulf, is an indicator of regional ecosystem health.